Solar panel on top the lamp recharges the battery with sunlight during the daytime. At dusk, they turn on automatically and remain illuminated overnight. No battery required, and also no wiring needed. These lights are made of decent quality stainless steel material, explosion-proof and no overheating. 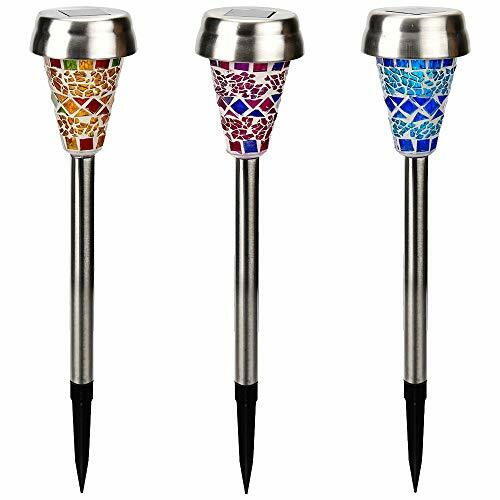 Mosaic Design: 3 Color Mosaic solar lights outdoor will be the best decorations for any garden and yard. Blue, purple and yellow mosaic lampshades make landscape lighting unique! Easy Installation: No wiring required. Unscrew the lamp cap, turn on the switch, make the pieces together as picture shows, and directly insert it into soil to complete installation. Multipurpose use: These outdoor solar lights can be used in the front or backyard, garden, along patio or porch, or around your driveway, walkway or sidewalk. Energy Conservation: No electricity needed, and absorb sunlight to charge.These pathway lights are powered by a solar charged AA battery that is user replaceable.Rechargeable battery can work continuously for 8-10 hours once fully charged. If you have any questions about this product by GIGALUMI, contact us by completing and submitting the form below. If you are looking for a specif part number, please include it with your message.